Ok you lovely lot, I am very pleased to be able to share my first pages from my organiser with you! I'm not entirely sure how happy I am with this page but love the effect of the cute characters in the tape. Both stickers and tape were from paperchase. I've also decorated a double spread for this week. Again I'm not too sure on this, maybe it's beginners nerves? 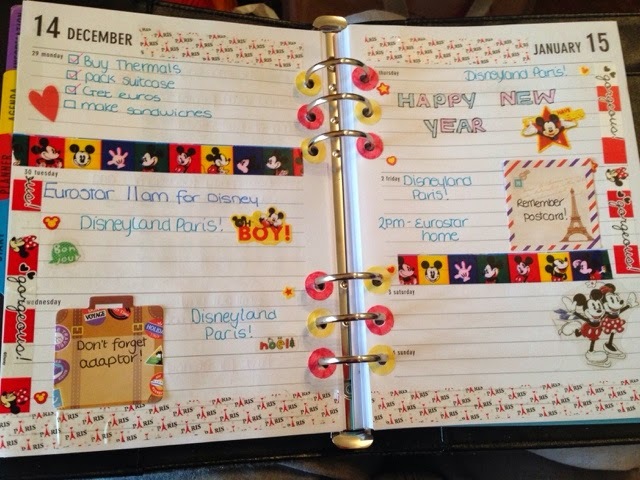 We're off to Disneyland Paris to see in the New Year tomorrow, so I've used a combination of Paris tape, which I received for Christmas and the Disney tapes which I already had. 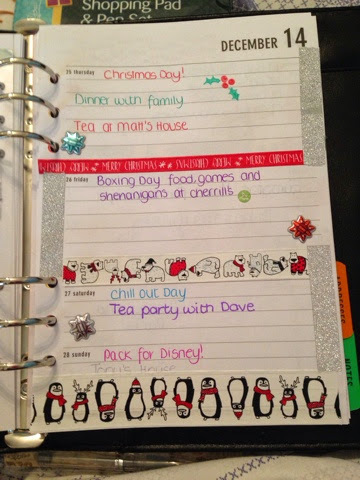 I decorated using Mickey stickers which came from Amazon, and felt the little travelling themed post-it's made a cute addition to the page as we're technically travelling this week.